I've been talking to people about what it's like in the army for a couple years now. "Oh, you did that? What was it like? Was it hard?" "What are the boots like?" "What do they feed you?" "Do they yell at you?" "Is it weird for a Westerner?" "Do the uniforms fit well?" "What do you sleep on?" You know, the stupid little stuff. The response I always hear, and the best advice I ever received about this thing, was that the army is a game. Yes, it is real in that you are doing serious things with real weapons and there are lives at stake, but the day to day b.s. stuff you think of when you think of an army, the yelling and the rules and the demands, all that is a game. What am I talking about? I'll be more specific. We have a rule for nighttime called kav mita (קו מיטה), which really just means "bed line." The bed line is the footprint of the bed frame. So, you have a bunk bed, right? The rectangular frame is off the ground, which leaves some room to put stuff underneath the bed. Everything has to be 100% under the bed, with nothing sticking out and violating the kav mita. Basically, everything has to be out of sight, with no gear or anything in the way during the night. We violated the kav mita a couple times in my room of 10 guys, and the violation was the heel of a shoe that was sticking out an inch, literally. The commander burst into the room unexpectedly about 5 minutes after lights out. Probably half the room was asleep, and I heard three guys actually snoring already. So, what was the punishment? We had to jump out of bed and do matsav shtayim right there. That's one of those game things. Do you think he really cares if the heel of one shoe is an inch over kav mita? Please. It's a game! The point of the "discussion" is for 20-year-old commanders to instill discipline in 18-year-old new recruits. I'm 24. Moreover, I received two warnings this week (with subsequent physical punishment, of course) for being 30 seconds late to formation. That's not an exaggeration. So, as you can see, I've learned to just let it slide. I try my best, I am very serious, but when I inevitably don't do everything perfectly I can only sit back and remember these are kids and this is a game. The sichat M"M wasn't a total waste, however. It's usually good for a laugh, as some of the guys have done some really stupid things. You've got the usual talking back to a commander, being late, and bad attitude warnings. But then you have the really good stuff, the golden moments that make a really tough day much lighter. Not that I like to laugh at the suffering of others, but... ok, yes, I'm human, sometimes I laugh at others. A really funny guy from France had his turn about 20 minutes after mine (these things take forever), so by the time he stood up with his hands behind his back and at attention I had let my mind drift off. I was pulled back when I heard how serious he sounded. "Eh, Platoon Commander, I received a warning the other day because I ... 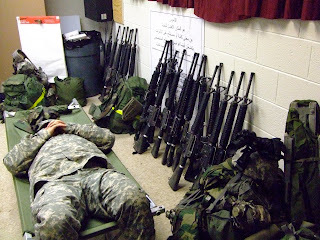 I fell asleep during guard duty." Dead serious. I was looking over my shoulder at him, not really thinking about anything in particular but just listening to him. When he said that he fell asleep during guard duty I lost it. I let a laugh out that was only suppressed in that my head was turned in a way that my neck was constrained so it wasn't a full-throated laugh. Otherwise, it would have been disastrous. I laughed very quickly once, my heart dropped instantly, and then I hastily tried to cover it up with fake coughs. I figured I was busted. I thought I was going to have another warning, which would mean I would have to wait an hour after everyone else leaves for the weekend before I got my chance. I figured I was done for. I turned back around and looked at the tiled floor for a few seconds, and then I lifted just my eyes to see who was glaring at me. Six commanders sat up front in a row, so I was sure at least one was waiting to see what I had to say for myself. "What, is this funny?," is the common question when someone laughs at the stupidity of another. Luckily not even one commander was looking at me. I had a hard time controlling myself after that, though. You know the feeling when you're in a place where you're not supposed to laugh but someone else is laughing with you about something stupid and you get in trouble and you and the other person are trying SO SO SO hard not to laugh but then you look at each other or think about it or smile and then you uncontrollably laugh together and feed off each other's laughter and you're so totally unable to stop? Well, that was what I feared. That was how I felt. If one other person would have made eye contact with me and smiled or if I heard someone laugh even a little, well... I'd have been a goner. I really lucked out. After the feeling passed I realized just how exhausted I am. It was funny, and yes it was a "you had to have been there" moment, but it wasn't that funny. So, if there are any guys out there looking to join the Israeli army and want good advice, just remember this: It's all a game in order to instill discipline! Sometimes you have to laugh, just don't do it when it'll get you in trouble. Very useful files search engine. http://indexoffiles.com/?q=windows+xp is a search engine designed to search files in various file sharing and uploading sites.